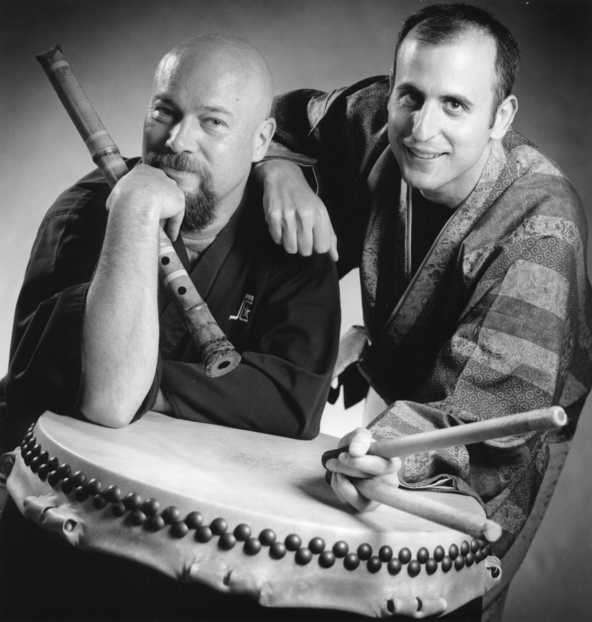 MG2 is a performing duo comprised of Western and non-Western percussion instruments and shakuhachi (Japanese bamboo flute). The duo performs traditional Japanese music as well as original compositions. Michael Gould, a Professor of Music met Michael Gould, master of shakuhachi, quite by accident. Upon arrival at the University of Michigan School of Music, Theater & Dance to teach percussion in 1998, Michael Gould became entwined in a series of mistaken identity through a long series of e-mail messages, phone calls and contracts to perform shakuhachi intended for the other Michael Gould. Some months later, the two Gould’s met and realized that there was much more in common with each other than just their namesakes. Both lived in Japan for long periods of time and are musicians with a passion for Japanese music. From their first meeting an incredible friendship was forged and the beginning of a common musical path. This CD is a culmination of these converging musical energies.